Barbara Remington painted the covers for the first Ballantine Paperback editions of The Hobbit and The Lord of the Rings. Artwork was reused in puzzles, posters... Be sure to read Connecting with History - An Interview with Barbara Remington for a lot more information on the background story around her "Middle-earth Mural" commission. 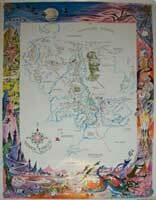 Barbara Remington's "Map of Middle-earth"